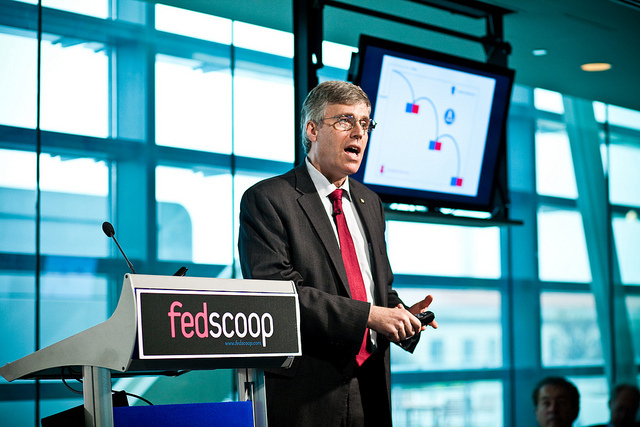 Department of Veterans Affairs Chief Technology Officer Peter Levin will resign effective March 1, he told FedScoop in an exclusive interview. Levin, recognized as one of the federal government’s most innovative and brilliant minds, has been the leading catalyst behind a number of ground-breaking initiatives to come out of the department, including the Fast Track electronic claims processing system, the Veterans Jobs Bank, and the open source custodial agent for health record modernization. Levin is perhaps best known for leading the Blue Button initiative, where a patient is provided a convenient, clickable “radio button” to download his or her medical records in digital form from a secure website offered by their doctors, insurers, pharmacies or other health-related service. VA recently announced that it had made the complete medical record – everything except diagnostic images – available via Blue Button. Since its creation almost three years ago, Blue Button has expanded beyond the department and has been adopted by hundreds of healthcare organizations in the private-sector, including United Healthcare, Microsoft, Aetna, RelayHealth and Humetrix.. The Office of Personnel Management announced it will require all healthcare providers on the federal health benefits plan to offer Blue Button. Last year VA expanded it to include a veterans’ service records to help in job searching. The Blue Button also became a model and template of the open data movement within the federal government as other agencies have copied the button approach – such as the Department of Energy’s popular Green Button. Levin has also been one of the leading proponents of the department’s innovation initiative, known as VAi2 and recently rebranded as VACI. In that program, the department funded more than 100 innovation projects, many of which are now being used across the department. Levin led several of their special projects, including the Blue Button for America contest and the early prototypes of Blue Button Imaging. modernization of the department’s electronic health management systems, which includes added use of OSEHRA – the open source custodial agent he helped create – to help certify contestants in the Medical Scheduling challenge. better understanding of the role of nutrition to help veterans manage chronic conditions. Prior to his appointment in 2009, Levin co-founded and led an award-winning semiconductor design software firm, was a venture partner at Dusseldorf-based venture firm Ventizz Capital Partners and was an executive director of Astaro A.G. He was a National Science Foundation Presidential Young Investigator during the first Bush administration, a Clinton White House Fellow in the Office of Management and Budget, and Alexander von Humboldt Fellow in the Department Mathematical Physics at the Technical University of Darmstadt. According to his biography, Levin is the co-author of more than 50 articles ranging from global positioning and cybersecurity to computer modeling and simulations. His policy essays have appeared in Foreign Affairs, The Huffington Post, on the White House website, and here in FedScoop. Levin studied in electrical and computer engineering at Carnegie Mellon University, and he subsequently enjoyed post-doctoral training at the Technical University of Munich. His first academic appointment was at Worcester Polytechnic Institute, and he was later the associate dean for research in the College of Engineering at Boston University. He is a consulting professor of aeronautical and astronautical engineering at Stanford University.